A hot tub is a significant investment so it makes sense to take care of it. Owning a hot tub is like owning a car; it needs servicing and maintenance to keep it working properly. 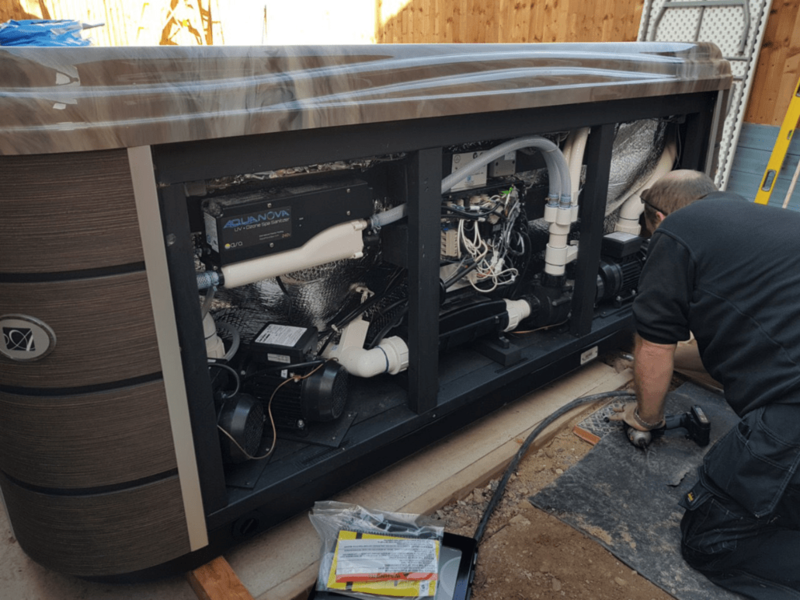 Here at Platinum Hot Tubs Essex, our skilled service technicians can help you with a range of servicing, maintenance and cleaning options to keep your hot tub in excellent condition. When a Hot Tub is not serviced or properly maintained, the pipes inside will eventually become clogged with a build up of dirt, grime and debris. This is a big health hazard as the water can become contaminated with bacteria, mould, parasites and viruses. The build up of debris can also damage components which can be costly to replace. Having your hot tub serviced is very important to keep it working efficiently and to ensure it has a long life span. The performance of your hot tub can slow down and deteriorate over time. This may be caused by issues such as hardware faults, dirt and contamination or chemicals in the water. If your hot tub is not running as it once was, sounds strange or has cloudy water then it may need servicing. These issues can be prevented and resolved by having regular servicing and maintenance. Here at Platinum Hot Tubs Essex, we can help you diagnose your hot tub problems and quickly resolve them. Servicing your hot tub will ensure that it the lifespan is enhanced, prolonging the durability and performance. A hot tub is a big investment so you want to keep it working well for a long time. If you fail to have your hot tub serviced and maintained periodically, you could develop issues that impair the functionality which could lead to further serious problems which are irreparable. This could mean your hot tub only lasts a few years or less which is a big disappointment after a substantial expenditure. By caring for your hot tub, you are caring for yourself and your family/friends health. Contaminated, dirty water can carry all sorts of pollutants and toxins. There is also a risk of bad chemical reactions and nasty residues that can build up. Therefore, it is important that you provide a safe environment for everyone who uses the hot tub, by having it properly cleaned and serviced. Failing to do so may lead to troublesome health consequences. A hot tub service technician will be able to identify any underlying issues your hot tub may have. Your hot tub may not be showing any obvious signs of problems but a technician can spot potential issues that could cause a problem over time, thus resolving it before it gets worse. At Platinum Hot Tubs Essex you can help to prevent issues with a visit from one of our skilled hot tub technicians; so you can enjoy a trouble- free, relaxing experience. Regular maintenance and servicing of your hot tub can help you relax and feel safe in the knowledge that your family and friends are in a clean, secure environment. Platinum Hot Tubs Essex, have a skilled team of technicians who repair, clean, service and maintain your hot tub. With services such as water care, chemical balancing, and scheduled maintenance; we can help keep your hot tub in tip top condition. Our maintenance and servicing is effective and efficient. We have repaired a large number of hot tubs throughout Essex and have different service options to suit you. All of our Hot Tub service options will reassure you that all pipework and electrical components are operating safely and correctly. A deep cleanse and service will ensure all of your hot tub is clean; including pipes, filters, pumps, jets, cover, pumps, ozonator and shell. This will include a thorough technical check of all components and control systems. A fresh start service is designed for hot tub drain downs and water changes. This will include emptying the hot tub and giving it a deep clean of the shell, filters and the cover. Rinsing out the hot tub and refilling it with fresh water and checking the chemical water balance. A winter shut down service helps to drain and shut down your hot tub ready for winter. This includes a complete system flush, a deep cleanse of the shell and filters and disconnecting some components. A new season/start up service is perfect for those who have just purchased a hot tub or want to start using it again. This package includes: a full inspection of components and parts, inspection for leaks, tightening and replacement of seals, refilling the hot tub with fresh water and checking the chemical balance of the water. Be safe in the knowledge that your hot tub is being taken care of properly when you schedule hot tub service with Platinum Hot Tubs Essex. If you would like to know more about our hot tub servicing or would like to book an appointment then please don’t hesitate to contact us, we look forward to hearing from you.